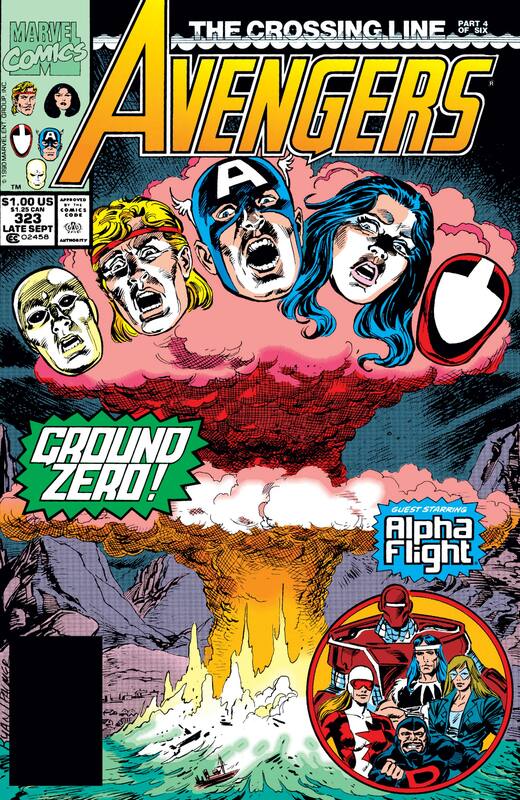 Avengers (v1) #319-324, “The Crossing Line” is one of the best Avengers stories of all time. 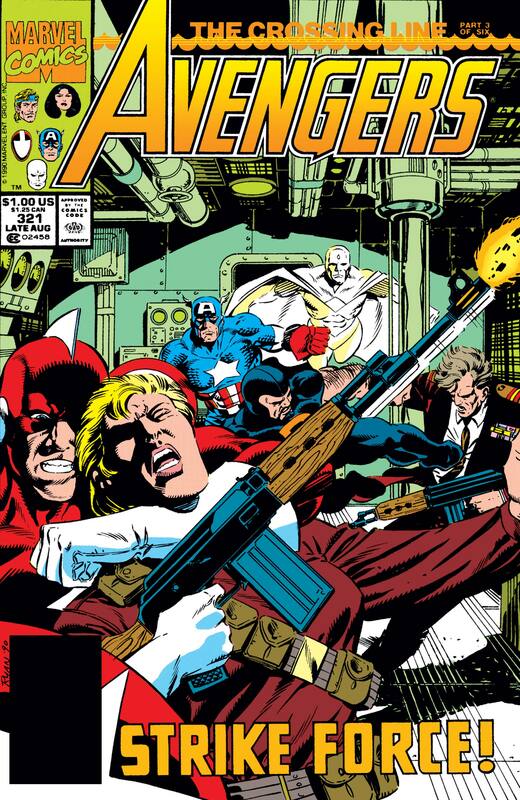 I had only dabbled in Avengers comics when Avengers #319 was released. I jumped in with issue #300 and the formation of a new and, to be honest, god awful team. 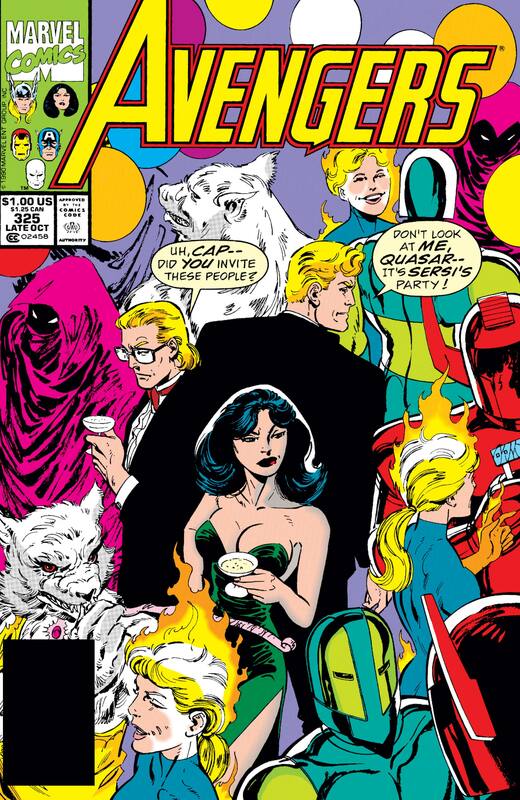 I stuck around for a bit after that because the line-up evolved to include not just Captain America, who I liked, but also Quasar, and eventually She-Hulk and the Black Panther. But even then the book seemed to lack direction. I knew who Fabian Nicieza was because I was a fan of Psi-Force, a book he and Ron Lim had turned into gold in a single issue. I was also a fan of Mark Gruenwald, not just for Squadron Supreme, but also Captain America, which I had been reading regularly for a while. Since Nicieza wrote the main story in #319 and Gruenwald wrote the back-up, it seemed like a good bet that I’d like this issue. I was also always a sucker for the bi-weekly summer comics that Marvel used to publish. For some reason they just seemed more exciting than the regular monthly books. I was not disappointed by either story in Avengers #319 nor with any issue in this six issue, summer time run — or even the issue that followed it, Avengers #325, which was the finale of the back-up story. It’s really hard to overstate the impact the Cold War had on comics. It gave superhero comics an instant bad guy whenever they couldn’t find one. And how many defection stories do you think have been published since the end of WWII and the fall of the Soviet Union? How many spy stories? How many stories about the arms race or nuclear war? Communism was the gift that kept on giving for comics. The problem is that more often than not those stories were always told with the same broad strokes. Ostrander & Yale, McDonnel, and Isherwood gave the most nuanced portrayal in the Suicide Squad. Ostrander did the same in Firestorm. In fact, it was usually DC that chose to delve into the Soviet Union do any degree, in part because DC seemed to use that nation in their stories more. “The Crossing Line,” however, is a great example of a Marvel comic doing justice to the Soviet Union or, when it was coming out, the last days of the Soviet Union. To set the stage a bit: a British nuclear submarine, the Waterwind, is hijacked by a group of Russian terrorists called the Peace Corpse (hey, it was the 90s). Their goal is to start WWIII in an effort to create a better world from its ashes. That might seem insane, but consider what Russia was like towards the end of the Soviet Union. They were taking drastic measures to save the world and they weren’t giving up much to do it. The British call in the Avengers to help. At the time, the team consists of Captain America, Quasar, Sersi, the all white version of the Vision, and a few others who aren’t available for this mission, so the team calls in Stingray for some underwater help. But these are Russian citizens, so Russia sends in their own super team, a group I have been fascinated with since they first appeared in Captain America #352. They are analogs of the Avengers: Crimson Dynamo in place of Iron Man, Perun in place of Thor, Red Guardian in place of Captain America, Vostok in place of the Vision, and Fantasma in place of the Scarlet Witch. They call themselves the People’s Protectorate. This, in and of itself, is great writing. The Russian team was originally called the Supreme Soviets, but given the political climate, they changed their name. Fantasma was also once called Fantasia, although no explanation is given for that change. And Vostok was once called Sputnik after the first satellite launched into orbit by the Russians. His name change is telling: the 1st human spaceflight was in the Vostok 1 ship. Given that Vostok is a synthezoid like the Vision, his name change indicates that he’s trying to become more human. Right from the get go we have the two great superpowers of the Cold War facing off, albeit with a little more complexity than usual. But the real genius of this arc is how Nicieza escalates the story from issue to issue. At the end of the 1st issue, the two teams are attacked by a third group — Atlanteans. It seems the submarine and those following it have wandered into an area controlled by Atlantis, which at this point in time is notably not being run by Namor. Tyrak, Merrano, and Orka lead Atlantean soldiers in their assault. The sub takes damage in the battle and must dock and it does so in a village in Canada. While the Avengers and the People’s Protectorate have moved past the Atlantean threat, Canada has some heroes of its own that would like a word with everyone involved. Enter: Alpha Flight. Nicieza had recently taken over as writer of Alpha Flight, so his work on this arc is something of a PR move for his regular gig. If you’ve never read his Alpha Flight run, it’s great, although the Michael Bair art takes some getting used to. The Alpha Flight group consists of five members, which is in line with how the other teams have been represented so far: Guardian (formerly Vindicator), Puck, Shaman, Box, and Diamond Lil. It’s a good mix of characters in general, but particularly good if you’re looking to drop a few teasers for the regular AF series. Obviously, the superheroes are going to have to take action against the terrorists on the submarine and they do. But wouldn’t you know it, the Atlanteans decide that they need to save face and come back to take on the two (now three) super teams. Most superhero stories would end with a confrontation between all five factions (Avengers, Alpha Flight, Atlanteans, People’s Protectorate, and the Peace Corpse) and most superhero stories would do something strange like having the Atlanteans join the terrorists to fight against the heroes from three countries. But this story does none of that. Instead, the good guys lose. The two leaders of the Peace Corpse connect themselves to the submarine so that they can trigger the nuclear missiles with their thoughts. The Avengers manage to disconnect the terrorists, but didn’t take into account a fail safe which detonates the nukes. Thankfully, Shaman is there. Yes, Shaman. Those familiar with Alpha Flight (and if you’re not, fix that), Shaman has a magic bag that can do all sorts of things. One thing he’s never done with it before is turn it inside out. I mean, the inside is magic, so that would seem like a crazy idea. Nuclear explosions necessitate crazy ideas. Shaman turns the bag inside out and back, pulling the entire town, part of the ocean, and all the people into various different dimensions and leaving a hole where everything once was in our world. Shaman remains, keeping the contents of his bag inside through sheer strength of will. While the heroes have to get everyone together so Shaman can free them, that’s not their biggest problem. Their biggest problem is that it wasn’t just people and places that Shaman sent into his bag; it was also radiation. There are more details to the story that I’m leaving out, but I don’t want to give away the entire thing. It’s a great story and well worth your time to track down. As of now, I don’t think Marvel has collected it anywhere. The art for the arc rotates between pencilers Paul Ryan and Rik Levins, with inks throughout by Tom Palmer. Palmer is a heavy inker and he imposes a consistent style to the issues regardless of penciler. The late great Ryan is the stronger artist, although Levins does solid work. Palmer’s inks are so heavy, anyway, that it’s ultimately irrelevant. Still, Ryan conveys emotion better than Levins does. Honestly, if someone hasn’t written up a Paul Ryan retrospective at this point, maybe I will, because he was a great artist. As if the main story wasn’t enough to make these issues great, there’s also a back-up story running throughout. Written by Mark Gruenwald with pencils by the criminally underrated James Fry, Jim Reddington, Brad Vancata, and M. Ritter, the story features “the Avengers Crew,” a handful of character responsible for the day in and day out functions of Avengers Mansion. Gruenwald fills the staff with a handful of characters from various corners of the Marvel universe, none of whom were ever the focus of a story, yet all of whom have complicated pasts. John Jameson – Son of J. Jonah Jameson, former astronaut, and former Star Wolf! This story is vintage Gruenwald. Each vignette is character driven, each character loaded with history, and in the end we see that they are being manipulated by characters Gruenwald had recently established in the pages of Captain America. 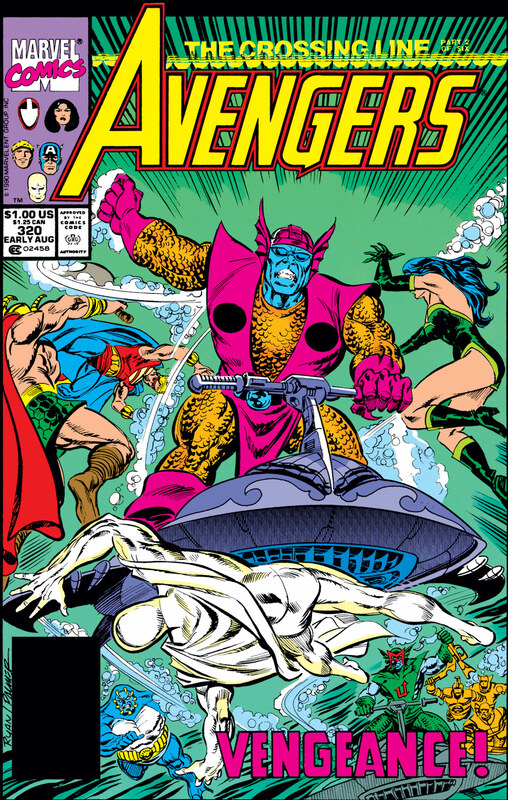 The finale of the story requires an entire issue to tell and takes place in Avengers #325. It’s pretty great in its own right. Those summer bi-weekly comics that Marvel published featured some great stories that felt special because of the schedule. While the decision was sales driven, as a kid it felt like these stories must have been so great that they had to come out sooner. In the case of this run of the Avengers, that was true.